Before I learned about Lorraine Hansberry, Zora Neale Hurston, and Bessie Coleman I read about Nellie Bly. I was a ten year old black girl living in a pastel colored wooden shot-gun house on an un-paved street in Panama City, Florida when I read about this adventurous, outspoken, writing woman. Today, Google Doodles honors her 151st birthday. And just as Karen O. sings, Nellie Bly made me “want to make something” of myself too. 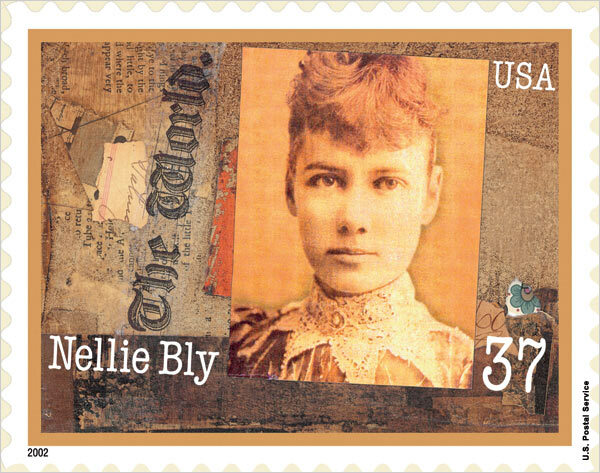 Nellie Bly was one of my childhood idols as well. The way she exposed the maltreatment of the women and girls at the asylum on Blackwell’s Island, and her travelling around the world in 72 days, are my favourite accomplishments of hers. She was a pioneer in the truest sense of the word. I think Nellie would be smiling over how far you’ve come, and all you’ve created, Skywalker. Keep being you! I love this insight into the influences that have made you who you are Skywalker. Thanks, Suzanne. It was a fun, quick write. We had to learn the Steven Foster minstrel song about Nellie Bly when I was in 8th grade. Of course, they never bothered to tell us she was a real historical figure or that she had major accomplishments to her credit. You know, for a while I was thinking she was fictional. I’m glad Google honored her this way. It’s amazing and humbling to reflect on the events and people and ideas that have shaped us. Glad you shared this, Skywalker.